Flowers, Flowers everywhere…A rainbow greets your eyes as you look out the window! What a feast for the senses. There are many activities you can create with the flowers in your life. What is each flower’s name? How many different kinds of flowers are in the yard/park/neighborhood? How are the flowers alike? Different? What shapes and colors do you find? How many yellow or red or purple flowers can you find? Are all the leaves the same? Are all the flowers the same height? Do all the flowers smell the same? Which flowers do the bees and hummingbirds seem to like the best? Take a photograph of your favorite flowers. Use a sketch pad to draw flowers. Dry or press a flower and use it in a craft. 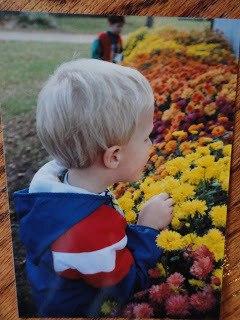 Older children can research the names and functions of the different parts of a flower. Investigate using a magnifying glass to take a closer look. Pick a bouquet of flowers for that special someone or to brighten up the kitchen table.